END THE BLOCKADE OF GAZA ! We ask you as our Foreign Minister to call for an end to the settlement building in the West Bank and also of the Gaza blockade. It is beyond dispute that the Israeli settlement policy constitutes a continuing breach of international law. The settlements violate the right of the Palestinian people to self-determination. Expanding Israeli settlements now have control over more than 42% of the land in the West Bank. One fifth of the land occupied by settlements is built on private Palestinian land. Israel has rapidly expanded settlements across the West Bank, including East Jerusalem: the number of Israeli settlers has more than doubled from 262,500 settlers in 1993 to over 520,000 today, across the West Bank, including 200,000 in East Jerusalem. According to Oxfam, the Israeli government provides a subsidy of up to $28,000 for each apartment built in a settlement. We are also deeply concerned about the increasing levels of settler violence against Palestinian people and property. According to the UN Office for the Coordination of Humanitarian Affairs (OCHA), settlers attacks on Palestinians in the West Bank occur on an average of one a day. Last year there were 399 assaults, 93 in which Palestinians were injured, another 306 in which their property was damaged or destroyed. This violence is all the more alarming as Palestinians are neither protected nor given due recourse to legal process. The Israeli human rights organization Yesh Din published dated data in October 2013 that showed that the investigation of incidents of settler violence by the Israeli Police in the West Bank was “almost non-existent”. We also feel that urgent action needs to be taken to lift the continuing blockade of the Gaza Strip. It is a clear breach of the rights of the people of Gaza. Not only has it strangled the livelihoods and industry in Gaza – figures published by the UN agency OCHA in 2013 show that over a third (34.5%) of those able and willing to work are unemployed, one of the highest unemployment rates in the world – it is a mass humanitarian disaster waiting to happen. According to Oxfam, more than 80% of Gaza’s 1.7 million inhabitants are in need of humanitarian aid. Recent power failures and raw sewage flooding indicate how fragile the situation is there. It is indeed also essential to recognise and respect the security concerns of Israel and Egypt. However, these concerns need to be balanced with the basic needs and freedoms of all civilian populations. We note a recent statement (29 March 2014) by Farhan Haq, deputy spokesman for the UN Secretary-General Ban Ki-moon, calling on Israel and Egypt to “ease” restrictions imposed on the Gaza Strip. While any opportunity to improve the desperate conditions of the people of Gaza is welcome, we feel more should be done. It serves no political purpose to collectively punish a whole people. More than half the population in Gaza under the age of 18. These are the primary victims in a political stalemate. We wonder and fear for the mindset of young Palestinians in face of such brutal isolation from the world outside. We are deeply concerned by the absence of leadership by the E.U. and of our own government on these key issues. We urge you to act on these key issues and to show some clear positioning at this critical time in the peace talks between Palestine and Israel. In particular, we ask you to call for an end to settlement building in the occupied Palestinian territories and for an end the blockade on Gaza. 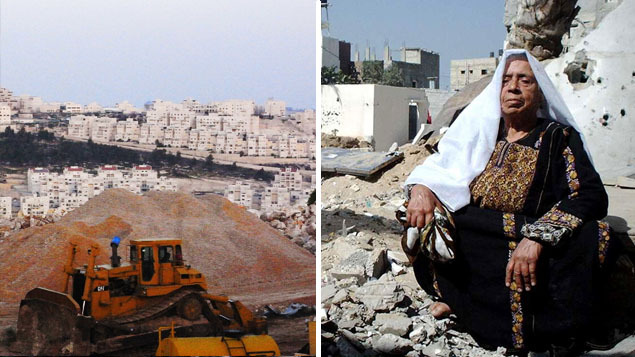 These two issues are major obstacles to the development of an independent Palestinian state. We have all a duty to act and power to use in the name of humanity.